The Keychain Transmitter conveniently fits on any keychain. The four button transmitter can be programmed to arm and disarm the Skylink Security Control Panel (SC-001) or activates the Emergency Dialer (SLMS2001). Transmits up to 100 Ft from the security or dialer unit. 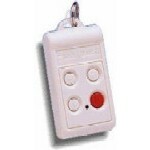 It has a panic button (red) that lets you remotely activate the siren on the Security Control Panel (SC-001) or remotely activates the Emergency Dialer. The function of the three white buttons is the same as the T1, T2, and T3 buttons on the Emergency Dialer.